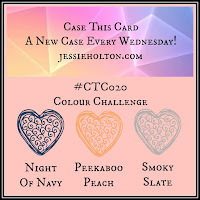 I made this card to enter into Jessie Holton's colour challenge this week #CTC020. I wasn't sure I would like the colour combination but, as it turns out, I really like it! It seemed like a good opportunity to break open the Balloon Adventure Bundle which I've picked up to use several times in past weeks .... and then put down again. Today was the day!! The set is designed to make a pop up card easily but I decided to use it for a panel for the front of the card today. I confess, I did add some Very Vanilla to the mix and I used it to cut the decorative balloon panel. I used the matching stamp set to stamp the banner and greeting in Night of Navy and used a Peekaboo Peach Stampin' Write Marker to colour in the lettering. I then partially cut the balloon bouquet again using Peekaboo Peach cardstock and glued the strings in place. I cut a bow with one of the dies also in Peekaboo Peach and glued it in place so that its ends overlapped the Very Vanilla border. 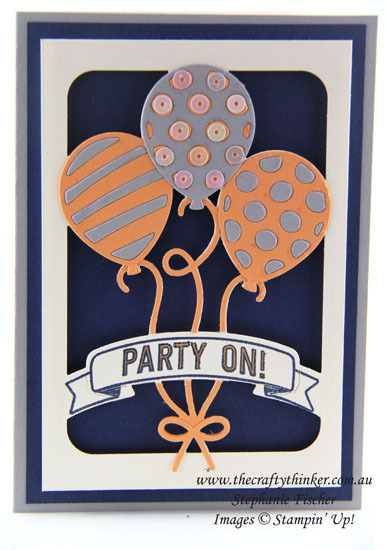 I cut the striped and spotty balloons from the die set using both Smoky Slate and Peekaboo Peach cardstock and then paper pieced, mixing and matching the colours. The gorgeous opalescent little sequins on the middle balloon are from the Cupcakes & Carousels Embellishment Kit. 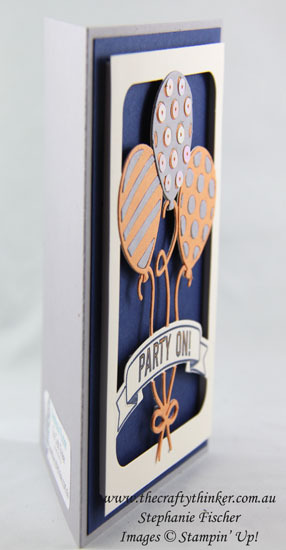 The balloon panel is attached to the card with Adhesive Foam Strips to provide dimension.